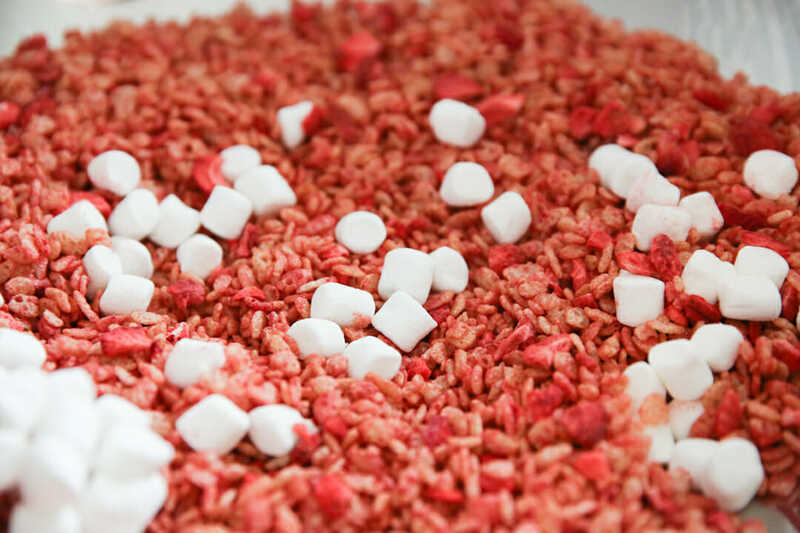 I was walking through the grocery store yesterday and saw this new flavor of Rice Krispie cereal and without hesitation put them in my cart and went straight to the baking aisle to get marshmallows because hello – Strawberry Rice Krispie Treats! I was happy to see they were flavored and colored with natural ingredients so I feel like they have more of a natural strawberry flavor (as opposed to like, strawberry chapstick, ya know?) These are gooey and sweet and I studded them with little bits of fresh (freeze-dried) strawberries. 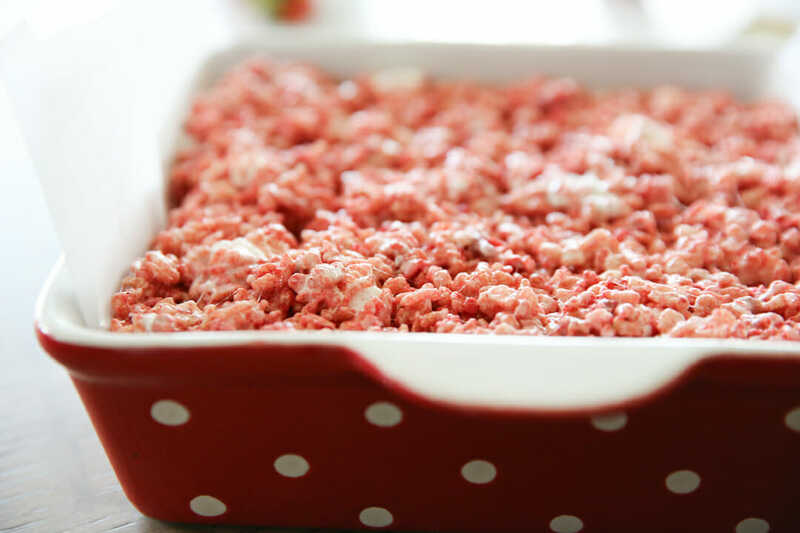 My family all agreed that this was one of their favorite Rice Krispie treat versions, yet! Keep reading for a secret ingredient that makes the flavor top notch! 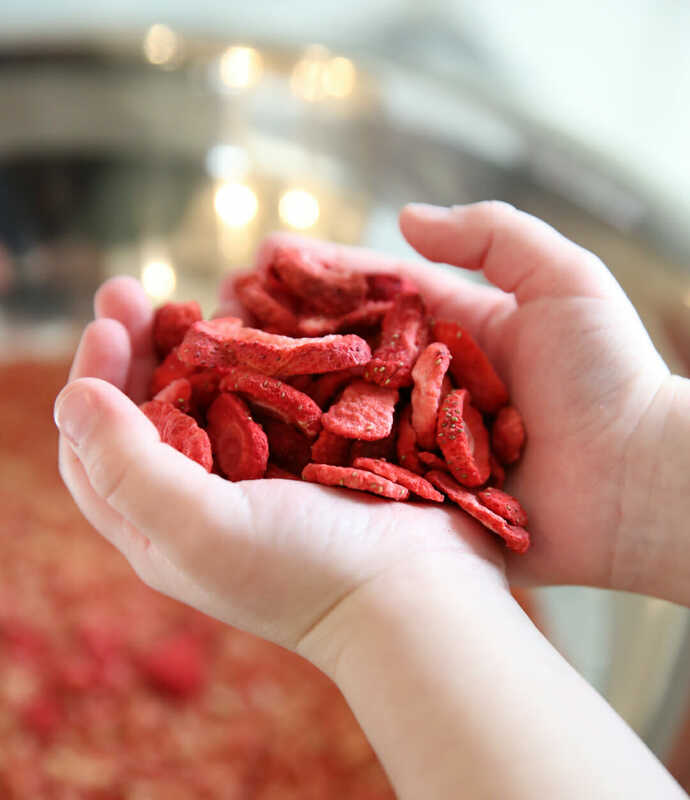 I wanted to add extra fresh berry flavor and texture here without fresh berries, obviously, so I turned to one of my favorite ingredients: freeze-dried strawberries. I actually have my own freeze dryer but freeze dried berries are so easily accessible these days! You can find them at most grocery stores and even at places like Target. The secret ingredient in that marshmallow goo is just a bit of almond extract. I add almond to pretty much anything strawberry or cherry because it just brings out the flavors so well. I’ve said this before, but if you don’t have an enormous mixing bowl, you need an enormous mixing bowl. I’m not talking about just a big one. I’m talking about an enormous one. You might have to store it in a closet or something but this is one of THE most handy items in my kitchen. At our house, we actually call it the “Rice Krispie Bowl” but it’s handy for any sort of mixed cereal treat. 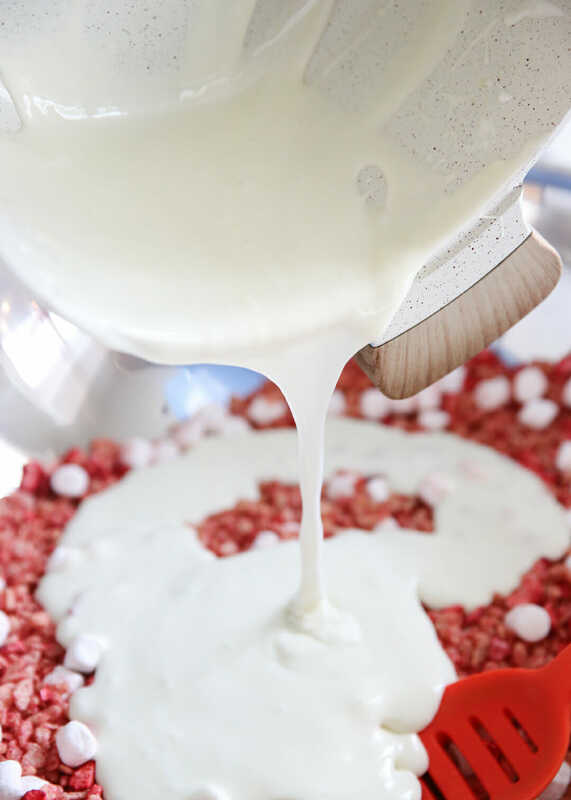 Even though it can handle up to a triple-quadruple batch of treats, I use it even for single batches because it makes stirring and tossing SO easy and you don’t lose half your ingredients over the edge of the pan. It’s also amazing for coated popcorn mixes, and salads for 100. You can grab one on Amazon for 20 bucks and I’m just sayin’- you should all have one!! If you’ve got a red polka dot pan, now is definitely the time to use it. TIP: Don’t pack down your treats. So many people pound on them at this point and that makes them hard and dense. Just gently pat them into an even layer and call it good. 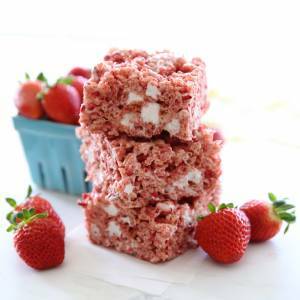 These are ultra thick and perfectly gooey and so adorably sweet and strawberry-y. All my kids and my husband commented on how amazing these were. I think you need them, too! Oh. My. Gosh……I do hope these make it to the U.K. soon. You are so right! Your Salted Caramel Rice Krispies are LIFE-CHANGING! Literally, they are like the only Rice Krispy treat we make now and take to all our family gatherings and church events. Can’t wait to try this newest version. I love Strawberry and Almond so these sound perfect! Almond extract is always an excellent idea. I made rice krispie treats with candy corn and a little almond extract back in the fall and they were so amazing. I’ll have to see if our stores have strawberry rice krispies. You’d be shocked at the number of things you can get in Idaho that I can’t find in southern California! Looks perfect for Valentine’s day if I can find this new flavor! 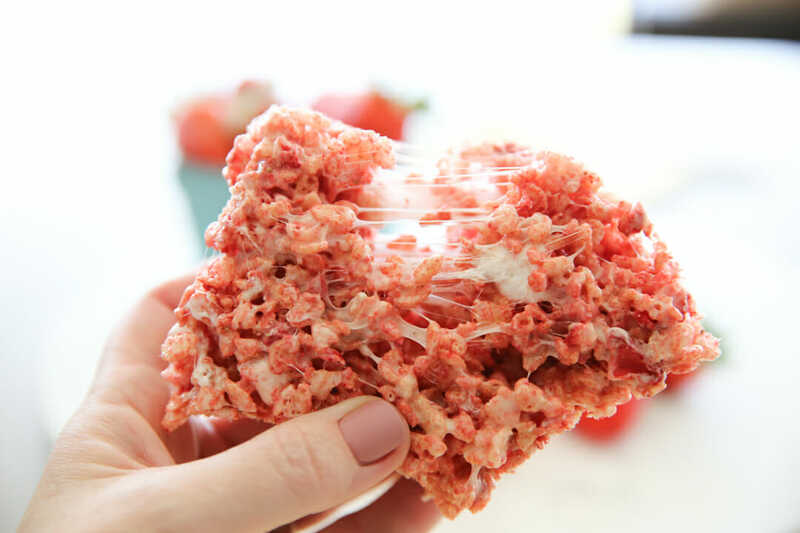 I need to find some of these rice krispies.. Be great for Valentine Day. These were really good! I might have snuck some white chocolate chips into the mix too. We made them today after church and my crew decided it is a winner! Husband keeps going back for more. Thank you for the idea! I found Strawberry Rice Krispies at my Wal-Mart. I’m excited to make these, but decided to wait and make it as a Valentine’s treat for my kids (and me). I went to the grocery store to buy the Strawberry Rice Krispies and didn’t see any so I asked the cashier and she looked at me like I was crazy. Where have you seen these at? They are brand new! Many Target stores carry them, so maybe check there! I accidentally signed up for the Valentine’s Day party take-home treat for my son’s 1st grade class, lol! I signed my name on what I thought was the juice box line, and it was in pen, and I didn’t have the guts to cross it out once I realized what I had done! I struggle with baking and being all creative, so when I saw this recipe I knew this was what I wanted to make. We made a test batch today and they are tasty!! Thank you for saving me, lol!! I forgot to buy almond extract 🤦‍♀️, should I use vanilla extract or just leave it out? Either one of those options is just fine! You don’t need to cut them, as long as you have the same amount (you can weigh on a kitchen scale to make sure) big ones are just fine! I found the strawberry cereal at Target, it’s also at my Kroger in Ohio too. I made these today for a Superbowl party tonight, and I don’t know if they will make it out of my kitchen, they are so delicious! Every member of my family liked them. So much more flavor than a regular krispy treat, and not as sugary sweet at ones made with Fruity Pebbles. The almond extract added some magic. Thank you for continuing to share treats from your kitchen, this was a win! My family loved these! 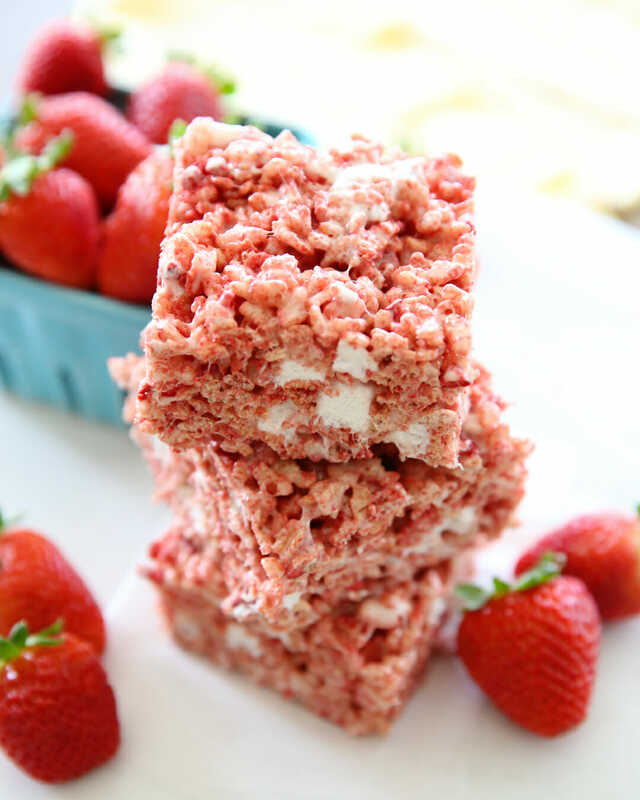 Best Rice Krispie treats ever! Our Young Women Group is making and delivering Valentine Treats. I have some regular Rice Crispies I need to put to use. 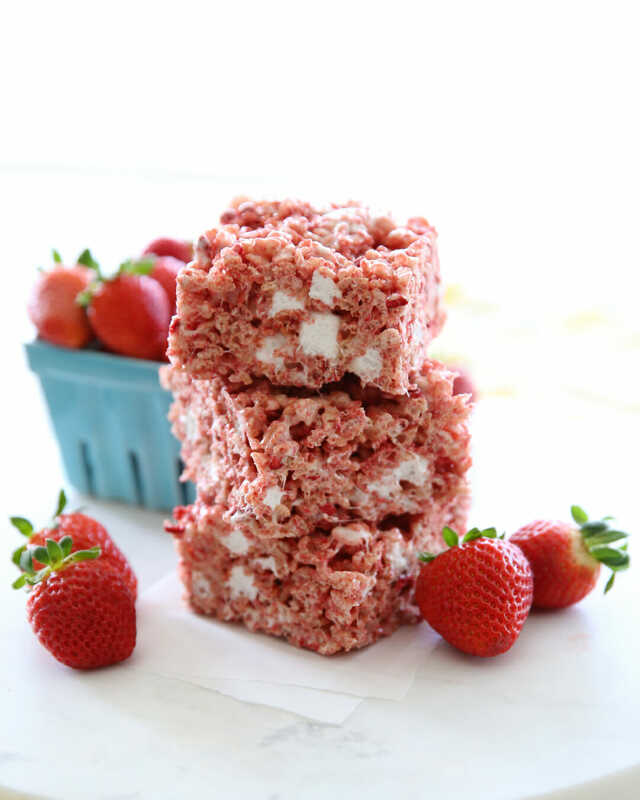 Do you think it would be okay to use regular Rice Crispies and dehydrated raspberries in this recipe? Sure- they won’t taste like strawberries, but those would still be good! Going to try these without the added freeze dried strawberries. My 2 huge local super grocery stores don’t have them. I’ve been checking for 2 weeks. It’s frustrating the things you can’t find in northwestern OH. Loved these! Made them this weekend, and the whole family and the extra guests we had over really enjoyed them. 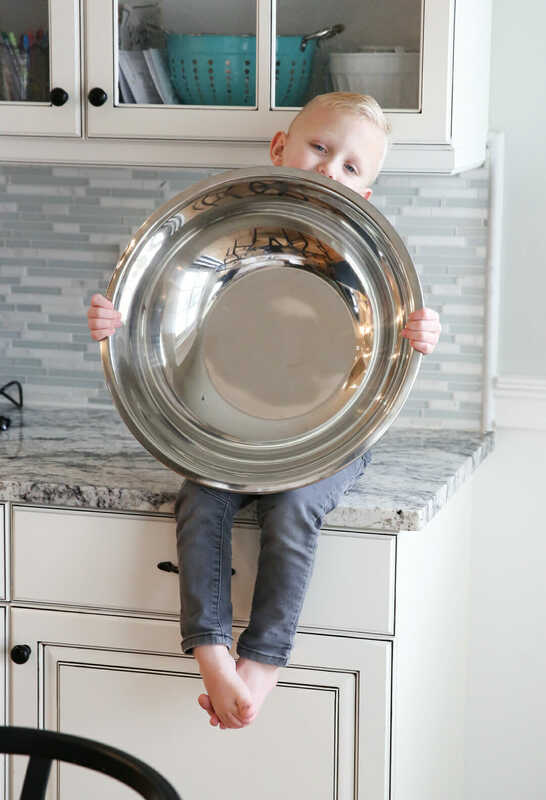 I put mine in a 9×13 pan, though… I was afraid they wouldn’t fit in the 8×8 I had. Thank you! I made these for my soccer team for Valentine’s day. They were a hit. I did have to make some substitutions. I couldn’t find freeze dried strawberries in a reasonable size and cost. Instead I added shredded coconut after fine chopping it in the blender. I didn’t have almond extract, so i used coconut and lime extract. It sounded like a combo you’d approve.